What is Tibial Eminence Spine Avulsions? Tibial eminence spine avulsion fracture is avulsion (tear away) of the tibial eminence (an extension on the bone for attachment of muscles) which most commonly involves the anterior cruciate ligament (ACL) insertion site. This injury represents the childhood equivalent of the anterior cruciate ligament (ACL) rupture and may occur because of abnormal outward bending or twisting, injuries caused by sudden halt of moving joints, excessive flexion (bending inwards) and internal rotation as happens in skiing and in motor vehicle accidents. Treatment options for tibial spine avulsions include extension casting for type I fracture, extension casting or open reduction and internal fixation (ORIF) if required for type II fractures, and ORIF for type III injuries. With the use of arthroscopy in treatment, it is possible to visually evaluate the reduction of the tibial spine fracture and check for articular or mid substance cruciate injury. 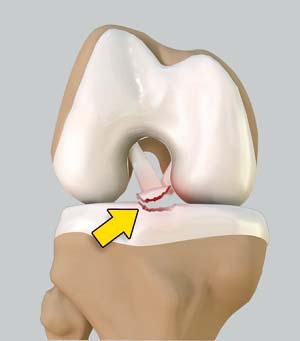 Fixation can be done using either the cannulated screws or non-absorbable suture fixation technique. Screw fixation is a very good technique in cases where the bony fragment is large enough and in patients in whom the growth plate is closed or fused completely, but in children with open growth plates and in conditions in which the fragment is not sufficiently large enough to accommodate a screw, a non-absorbable suture fixation technique may be considered.